Looking for a traditional camping experience? 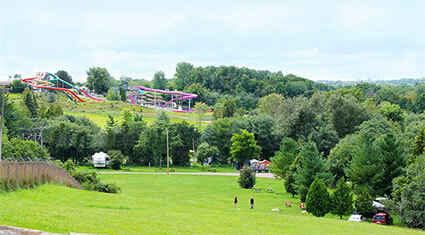 Bingemans Camping Resort is located along the picturesque Grand River. We are uniquely situated in Southern Ontario, in the heart of Kitchener-Waterloo and within close proximity to Guelph, Cambridge, Hamilton London and Toronto. We offer a camping oasis unlike any other without having to leave the city. With over 320 campsites and 139 seasonal sites, we offer a unique location for tent, trailer, and RV camping. Rustic log cabins and upcycled container cabins rentals are also available for those looking for the camping experience without a tent and trailer. Need some assistance in planning your camping trip? Contact us and we would be happy to help you make the most out of your Bingemans Camping Resort experience. Are you a first time camper? Peruse our "Beginner Camper Check List" to assist you in your planning.